We're experimenting on a new work schedule, early morning and then done by 12 noon. The freedom to go anywhere after lunch was a good perk, but the lack of sleep made us too tired to do anything else but get lunch and then get a ride home. The cozy setup by the door. However, since we weren't pressed for time to get back to work, we had the advantage of looking for a place to go to lunch at our leisure. 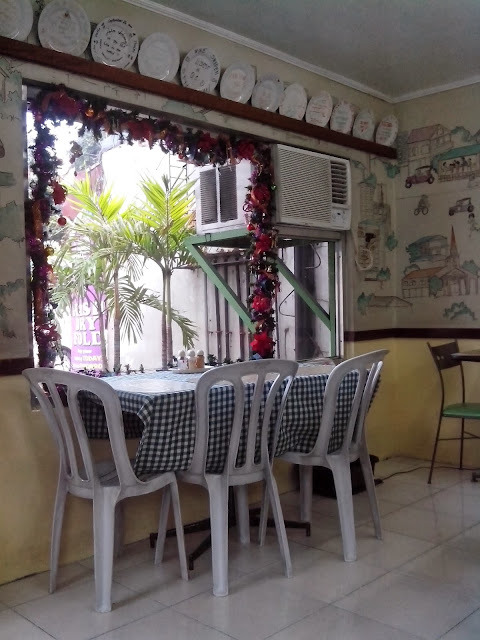 It was a rainy day when we decided to get a taste of some comfort food at Lola Idang's in Kamuning. We went in wet from the sudden, heavy rain and since the whole dining area was air-conditioned, we thought we'd be frozen delights. Fortunately, this was not the case as the temperature was just right for a cozy, warm meal. 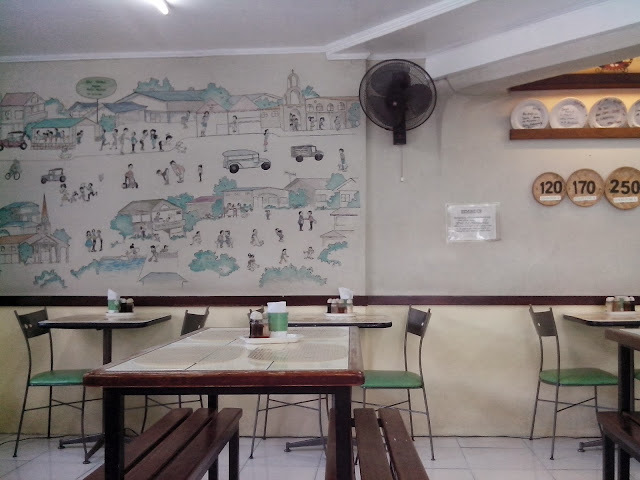 The place had a fun vibe too with the drawings on the walls and the rows of plates with compliments written on them by satisfied diners. Check out the fun drawings on the wall. The simple dining area felt homey and cozy. 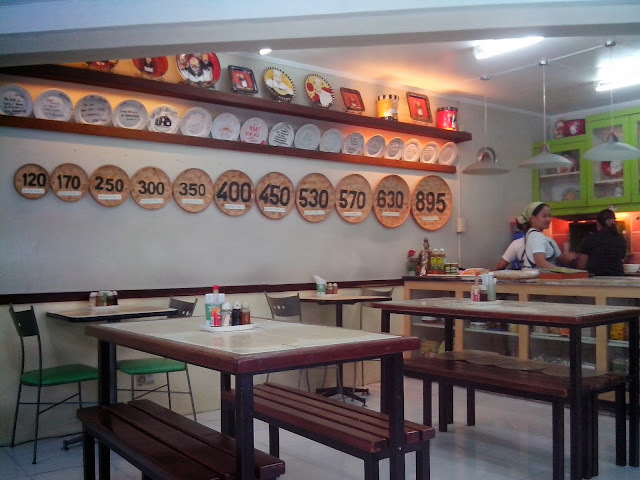 The different sizes and prices of their Palabok. Now on to our orders. My companion wanted comfort food fit for the wet weather outside. So she got a big, warm bowl of Goto (P40.00) and paired it with another big serving of Lumpiang Ubod (P40.00). 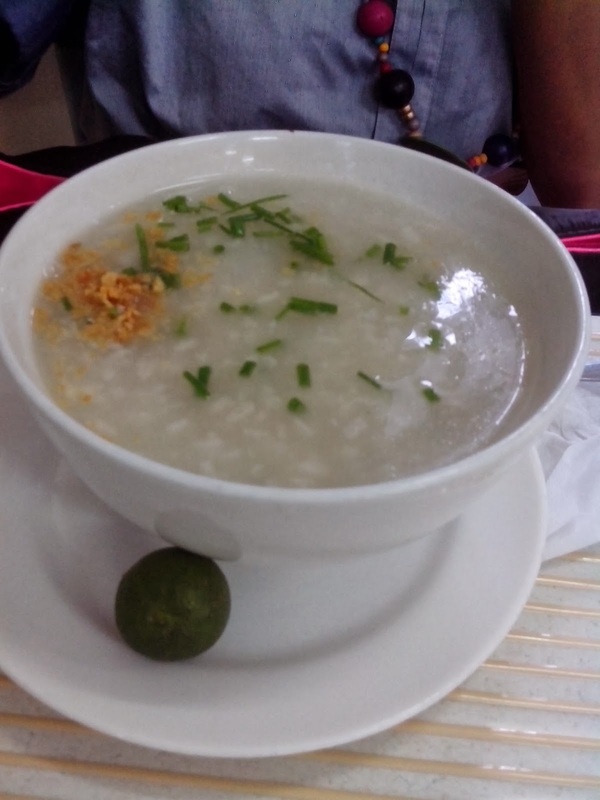 Gotta have some Goto (P40.00) on a rainy day. 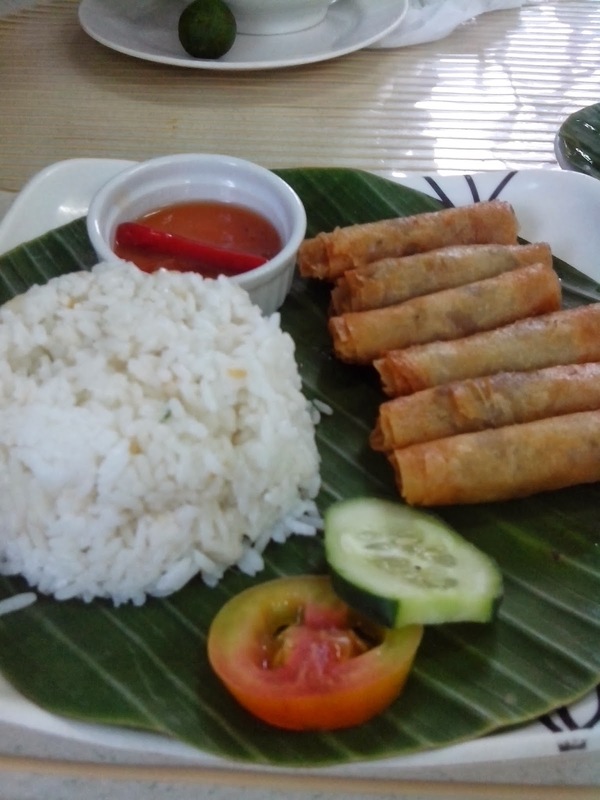 My order was their Lumpiang Shanghai Value Meal (P50.00). I liked that the shanghai was crispy and firm but not too oily. I didn't bother with the dip as the fried treats tasted delicious by themselves already and the garlic rice was a good partner for the lumpia. The banana leaves on both plates gave our meal a healthy feel despite both being fried. We we're both satisfied with our meals. What's even more delicious was that both our orders were very affordable and the service was great too. Our attendants were courteous and knowledgeable and had some great suggestions from the menu. Our orders were quickly served as well. 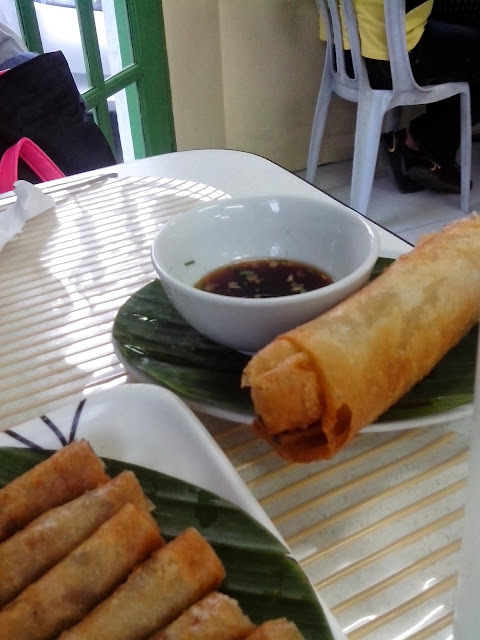 Because I was so happy with my meal, I ordered Lumpiang Shanghai for takeout (P70.00 for 12 pieces). I refried it just to reheat it the next morning and it still tasted as crispy as the first time I tasted it. 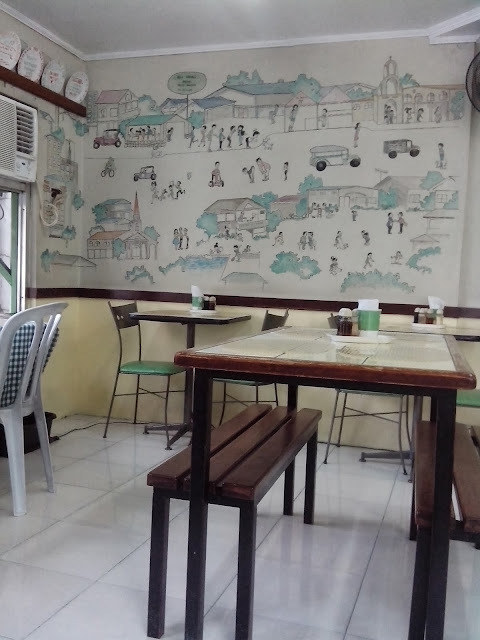 Next time, I'm planning to take home a whole bilao of their palabok. I hope to pass by here again.